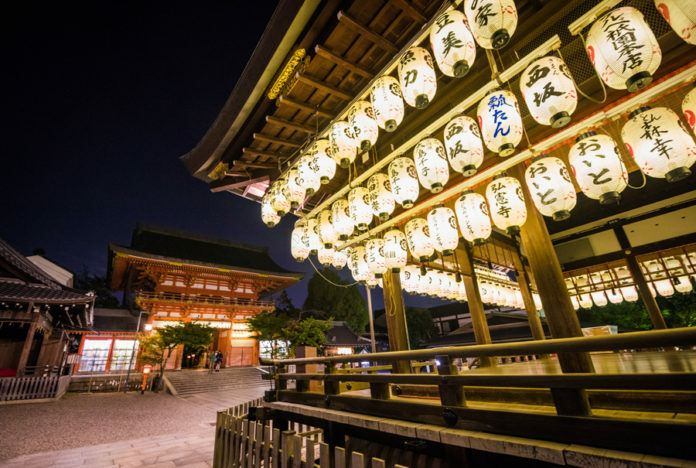 The Yasaka Shrine, or Gion Shrine, is a colorful attraction, both literally, and figuratively. This place is bustling with people and vendors and is located just north of the major shopping district in Kyoto, Shijō Dōri. This shrine has a lot of history connected to it. It is one of the oldest shrines in Kyoto, built in 656! Imperial messengers would use this site to make important announcements to the city’s inhabitants. In 869 a great plague scoured the city, and the mikoshi, a divine entity was paraded through the town in a divine palanquin to deter the disease’s aftermath. More recently in the late 1800’s this shrine was officially designated as the foremost important government supported shrine, or kanpei-taisha. We were torn over whether or not we loved this shrine. There is a beautiful lantern lighting ceremony that makes it worth it if you can time your visit at night. It’s truly beautiful. There was nothing particularly noteworthy here, and the only color we could find here was among the vendors. The vendors definitely piggyback on the nearby shopping district and you can find unique things to purchase here. We picked up a few yummy snow cones! ► For Kids: If you are going, make sure to go in the evening to watch the lantern lighting ceremony. The kids will also enjoy seeing the vendors and unique Japanese goods. On your way to the Yasaka Shrine, you may find yourself passing by the impressive Buddhist Temple, Chion-in. Though we didn’t stop, visitors are welcome on the grounds. ► Nap-Time Version: The Yasaka Shrine doesn’t take the top ranks of the hundreds of shrines to visit in Kyoto, but it’s still got some allure. If history is really important to you, definitely stop by, or if you are in the shopping district it won’t take much away from your day. If you are stopping just to stop, make time for others. The Yasaka Shrine is located in close proximity to the Ryozen Gokoku Shrine, and the Nishiki Market. 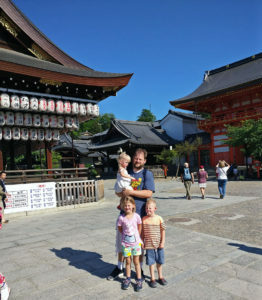 Check out our full reviews, and then head over to read our full list of adventures in Japan, including our first ever Diapers On A Plane Japan Vlog, Hiroshima, Kyoto and Tokyo.